On pueblo and cathedral, ruin and rebuilding | Wait... What? 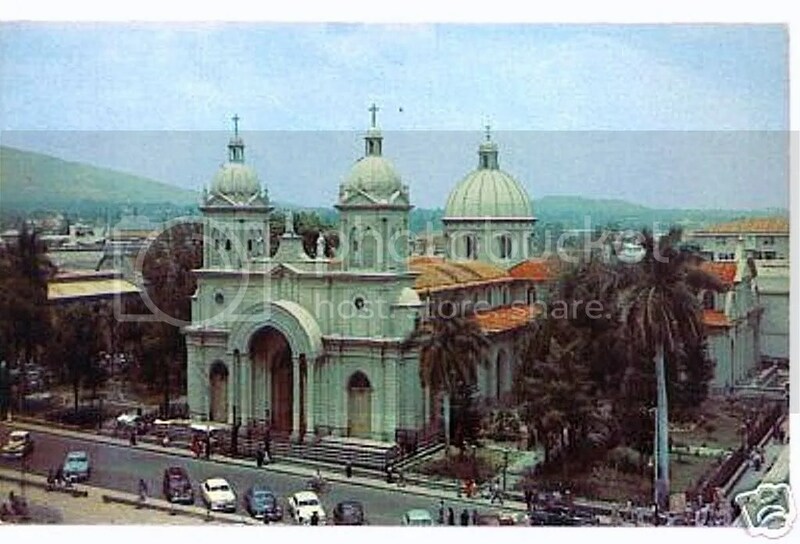 One of the signature pieces of architecture in downtown San Salvador is the Municipal Cathedral located in front of Plaza Barrios (popularly known as la Plaza Civica). The Cathedral, along with the Plaza are perceived by most Salvadorans as public space. Both the cathedral and the plaza hold a million memories of destruction and rebuilding. La Armonia de mi Pueblo is the title of the work that Salvadoran artist Fernando Llort created in 1997 to adorn the front of San Salvador’s Cathedral. Armonia is easy to translate into English – it means harmony. Pueblo is a bit more difficult. It’s a term in Spanish that includes the notion of both place and people. It comes from the Latin populus and can refer to a) inhabitants of a nation, country or region who share a similar culture; b) a population that farms in a particular zone (eg., a village or community); or c) the peasant or working class. So in essence, the title of the work is “the Harmony of my People”. Rather than a history of harmony, the cathedral itself has a history of destruction and reconstruction. It was erected in 1888 and destroyed by a fire in 1951. Reconstruction began again in 1956. Archibishop Oscar Romero became the Archbishop in 1977, inheriting the partially restored cathedral. He reportedly deferred work on reconstruction, preferring to spend the church’s funds on projects to benefit the poor. The earthquake of 1986 damaged the structure further. In 1990 reconstruction began once again. The mosaic gracing the front was completed by Llort in 1997 and the current cathedral was inaugurated in 1999. Aside from earthquakes and fire, other tragedies have marked the cathedral and the plaza. 1979. A massacre took place on the cathedral steps on May 9, 1979, as recounted here by journalist Ken Hawkins in a BBC article called “Witness to a Massacre“. Video footage in this accompanying article 1979: El Salvador Cathedral Bloodbath is eerily similar to the kinds of videos coming out on YouTube lately from Egypt and Syria, with armed troops shooting live ammunition into the backs of protesters. Towards the end of the 1979 video, people clamber up the steps of the cathedral in an attempt to find shelter inside. The military contends that protesters fired first, but witnesses have said the gunfire began on the side of National Guard. A close friend of mine was present during the May 9th massacre. She took me to a photo exhibit about it last year at The Museo de la Cuidad de Santa Tecla, telling me her personal story as we wandered through. She was 15 years old at the time and had gone to the protest in her school uniform, thinking she would be there just a few hours. She ended up trapped in the church for much longer, fearing what might happen next and helping others tend to those wounded who were still alive. The museum where we saw the exhibit was originally the Santa Tecla Municipal jail. After the civil war began, it housed political prisoners. My friend used to visit her husband there. He had been captured while participating in activities with the teachers’ union. The Santa Tecla museum is a remarkable feat in taking a painful history and reclaiming it for the public good. Among other things, it has served as a place for people with similar histories, those former families of political prisoners and the former prisoners themselves, and families of the disappeared and dead, to reunite, share their memories and losses, and build community. My friend told of going to the steps of the cathedral on a recent May 9, the anniversary of the massacre. She found a few other survivors there, standing on the steps, remembering. One of those people was the journalist who had photographed events that day. ‘It was so strange,’ she said, ‘after so many years, we were somehow drawn to each other, there on the steps.’ In addition to the journalist she met a rural man in a straw hat, who had also been there in 1979, and who showed her his gunshot scars. A couple of other women who had lost a relative were also there, sitting on the steps, paying their respects. 1980. Archbishop Oscar Romero, a friend of the pueblo and considered a martyr by many, was assassinated on March 24, 1980, while giving mass at a private chapel. On the 31st, his funeral was held at the cathedral and people traveled in from across the country to pay their respects, packing the Plaza Civica with an estimated 50,000 people, many old women and children. A bomb exploded somewhere in the plaza setting off panic and gunfire. Some say it was a ‘propaganda bomb’ designed to blow leaflets out to the crowd. Others say it was some other type of bomb. A journalist recounts his experience here. Dozens were killed in the resulting crush. My Salvadoran mother-in-law tells the story of one of our neighbors’ brothers being trampled to death that day, and how in hindsight, she is glad she wasn’t able to attend the funeral given what happened. The dead and wounded were carried up the stairs into the cathedral and many people hid inside until the dust cleared. Members of the leftist guerrillas were also stationed in and around the cathedral, guns loaded. Monseñor’s funeral, captured on film here, is usually cited as the official beginning of the civil war in El Salvador. 1992. On January 16, 1992, the Peace Accords were signed and I remember the resulting celebrations. My husband and I were afraid to openly participate in the street fest as you still couldn’t be too sure of what might happen. There were separate celebrations for the opposing sides: Arena and the FMLN; a couple of blocks from each other. Arena celebrated in Parque Libertad, right up the street from our apartment in Barrio Candelaria. The FMLN celebrated in the Plaza Civica, adorning the Cathedral with banners. We wandered through both celebrations, not stopping for long in either place out of fear, but feeling a tremendous joy all around us, especially in the Plaza Civica. Celebrating the Peace Accords in 1992. 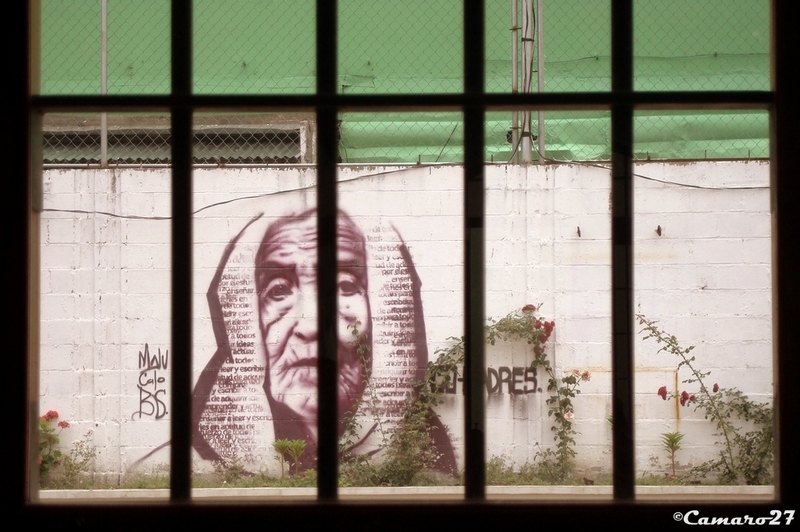 Image from the Museo de la Palabra y la Imagen in San Salvador; photographer Francisco Campos. 2011. I discovered this past weekend, however, that Llort’s tiles and his work, which he considered his greatest achievement of all time, dedicated to ‘God and Monsenor Romero,’ were being removed from the face of the cathedral. Some consider Llort’s work to be commonplace, saying it belongs ‘on a tourist’s towel, not on a church.’ Others feel that his work represents something truly Salvadoran. The latter are outraged that the mosaic was removed with no warning, and they are asking why. They are questioning the legality of the destruction of the mural, and wondering where is the respect given to art and culture in El Salvador. Photo of the tiles, on the ground in front of the cathedral. Church leaders have since apologized to the Llort family and to those who are upset by the surprise removal of the tiles. They contend that they consulted with the congregation of the cathedral, and got their approval to remove the tiles. But the Secretary of Culture has called the Catholic church out for their actions, condemning ‘the destruction of the face of the Cathedral,’ and accusing the church of violating the ‘Special Law on Protection of Cultural Patrimony’ which states that ‘although the mural on the Cathedral of San Salvador was not declared a Cultural Site, it was in process of being declared, meaning that under no circumstances should any interventions have been made.’ Any actions should have followed procedures according to the law, and these were not considered, according to an article in La Pagina. A group has formed on Facebook called Indignados por el Mural (Angry about the Mural) where debate is happening around the value of art and culture in El Salvador. It was originally rumored that the tiles were being removed so that they would not clash with a ‘more elegant and timeless’ sculpture that was being donated. Details about this statue were never obtained, and the reason given officially by the church for the removal of the tiles is that they were damaged and irreparable. Many have questioned this, asking why the tiles couldn’t have been restored as with other works of art. The cathedral means so much to so many that it’s not surprising to see people upset by the sudden change in its facade. Given the cathedral’s history, one might wonder if the ownership and path of the Salvadoran Catholic church is again being debated, as it has been throughout history. Does it belong to the rich or the poor? Why would such an important piece of art be removed in such an undignified way? Does the cathedral belong to the congregation that attends church there? To the church leaders? To the Vatican? Or is it a public good, belonging to the pueblo? In the wake of the destruction of the mural, one idea that has been suggested is to gather the smashed tiles and use them to create a new work of art in homage to Fernando Llort and Salvadoran art and culture in La Palma, Chalatenango. Given the cathedral’s history of ruin and rebuilding, and the notable ability of Salvadorans themselves to rise and rebuild from the ruins after earthquakes, floods and civil war, perhaps that is a fitting use for the remains of La Armonia de mi Pueblo. It still makes me sad, though. Note: updated on Jan 4 to correct errors in the dates related to the construction of the original cathedral. Updated: In this video, Fernando Llort reacts to the situation in a press conference on Jan 3, 2012. I am stunned. I began reading Lind’as blog post pleased with reference to one of my favorite places on earth. I was stunned by the narrative and images of the defacing of the Cathederal of Mr. Llort’s artwork. My home has serveral pieces of his art that I picked up during my four visits to El Salvador. My 1st visit in 2003, involved my desire to visit the Cathederal and the tomb of Monsignor Romero. While standing on the outside steps, my host, as a 9 year old in 1980, described hearing the shots while inside the nearby Mercado Centro and watching as the gates were closed and the screams of those trying to gain entrance to the Mercado during the Massacre. Senor Llort’s artwork typified the wonderful spirit of the Salvaderanos in the face of adversity over the years. A shame for its removal…..Thanks for informing us, Linda. Beautyfull LInda….Many thanks, this is your country! Umm… You might want to edit this one more time and republish. Pay special attention to vertigo the order of construction and destruction on the cathedral. Ooh you’re right. Thanks Nathan – corrected and updated.